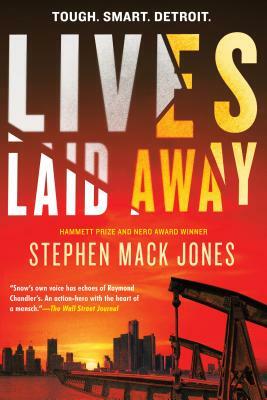 Stephen Mack Jones, who broke out with the eponymous first novel August Snow, named winner of both the Nero Award and Hammett Prize, is back. This time the former Detroit police office turned community advocate (with bullets) is pulled into a case not by a client, but by his conscience. The body of a young woman is found, dressed in an outlandish costume. It turns out she’s Latinx and undocumented, and this leads to thoughts that she might be the victim of human trafficking. The trail leads him all over metro Detroit, sleazy strip clubs to ultra-luxe subdivisions, and much in between. As Snow plays well with others, Lives Laid Away finds him teaming up with his godfather Tomás, who has an unusually large stash of weapons, Lucy, a young Indigenous hacker, and Trent, a man-bunned nonprofit worker with surprising fighting skills. Jones straddles noir fiction and thriller with this outing – on one hand, the narrative reads noir, keeping the perspective from the hero and not jumping to the villain, but on the other, it’s hardly a whodunit but more of a vigilante vengeance story that, warning to the weak-willed, gets quite violent. Fortunately, Snow still turns out to be a great Detroit tour guide, detouring to some tasty restaurants, and better still, he keeps his wits and wit about him – I love several of what I’ve come to call bailout scenes – when the associates of baddies talk trash about their former bosses when cornered.